Today I have a real treat for you. Since I’m participating in one of the two card swap events at the Scrapbook Expo this week. 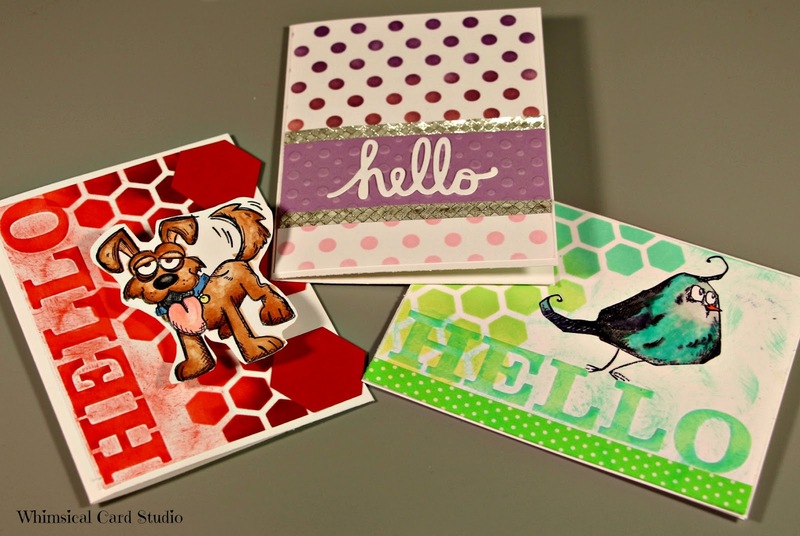 I am sharing those cards created on a wide variety of backgrounds I made instead of using patterned paper. The background techniques are not covered in this post, but if you tune back in this Saturday, I will be posting more details on how I created them. If you like the cards and want the exact backgrounds as I did them, I am offering the scanned files to you as of this Saturday when I have everything ready to go. So on with the eye candy (of the card variety)! 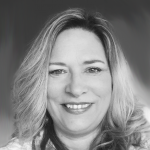 Here's the picture of my favorite of the whole bunch. But I'm just getting started. I created some sets of cards with something similar in common, whether it was a watercolor technique, marbling, embossing, etc. 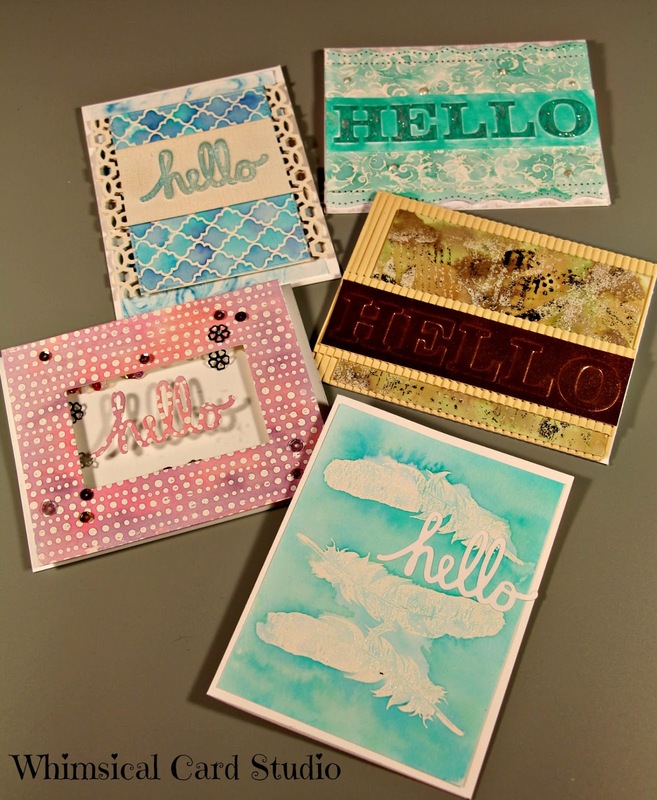 The theme for this card swap is “hello” so that’s why every card shown in the photo below has that sentiment. The first two sets are the watercolor backgrounds. 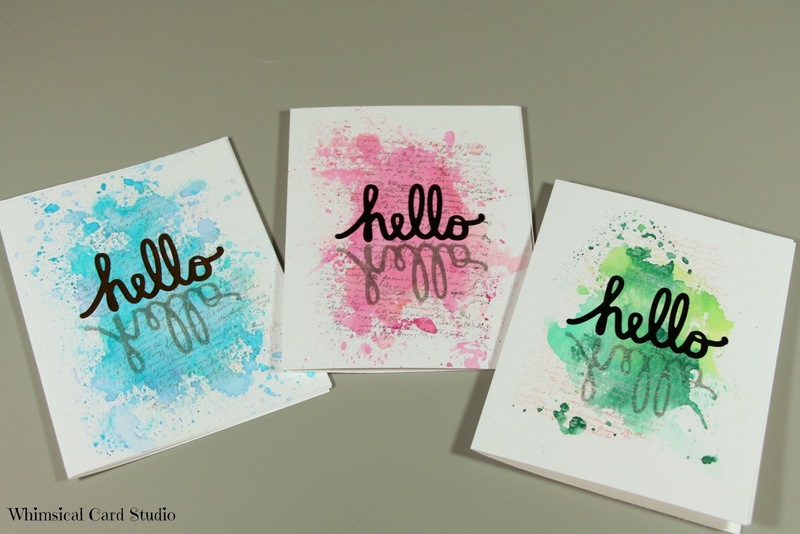 I used Ranger watercolor pre-cut cardstock to create these as well as Distress Inks. I used various background stamps to create an emboss resist effect with white embossing powder on some and the ink smooshing technique on others. Not much explanation needed. I put distress inks (usually 2 to 3 colors, one at a time) on a piece of acetate, spray with water then press it against the watercolor paper in the center. 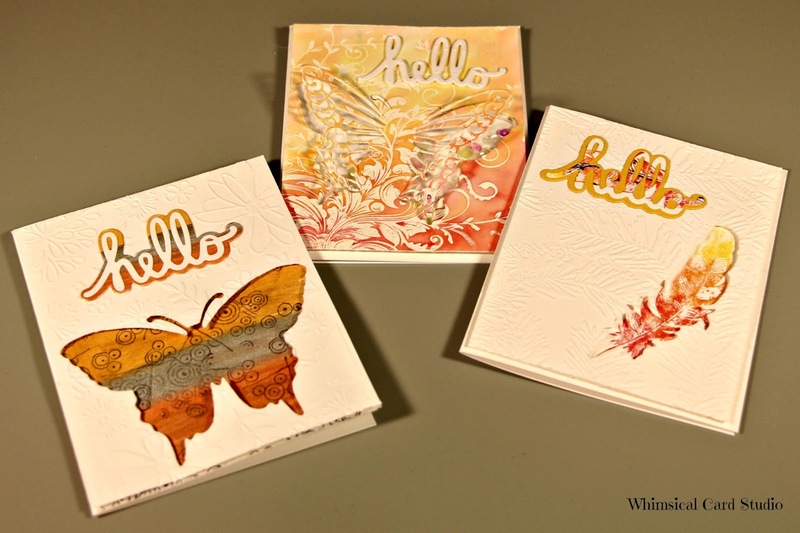 The sentiment die cut was heat foiled in various colors, but it's not obvious in the photo. I wanted to add a mirror image element so I die cut the sentiment into foam and used it as a stamp to create the shadow reflection underneath. The next set of 3 were done using die cutting. On two of them I used a die to cut out the shape in a white A2 panel, then embossed it. Before layering onto the card base, I colored in the space below where the die cut window would be. For the butterfly, I swiped across with 3 of the Rangers Distress Stains in Copper, Brass and Gold; next, I stamped over the top with this stamp in black ink. I popped up the top panel to separate it from the card base, and then added the stacked die cut sentiment “hello” with the shadow under it. The middle card turned out to be my favorite. I decided to try something new and did a partial die cut butterfly on the background. The secret weapon is a special die plate that has a recessed ridge in the center. By lining it up so that the ridge is directly over the center of the intricate butterfly die, it only cut out the wings, leaving it intact on the card panel. I turned this into a shaker card by adding acetate under the butterfly panel, then popped it up on foam to create a shaker space for the sequins. 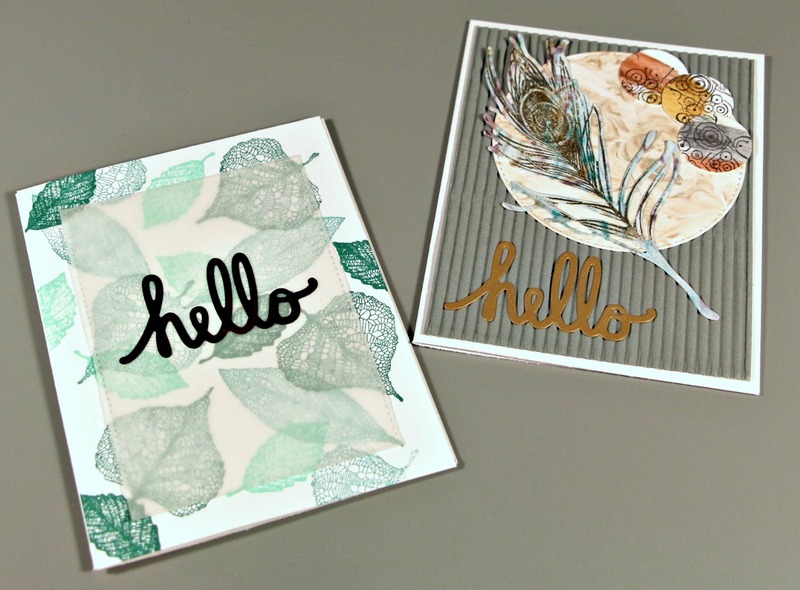 Last, I added the “hello” die cut sentiment. My go to technique for a thicker sentiment is to glue paper on top of thin craft foam then die cut it. The next group of cards were made with marbled backgrounds or die cut from one of them (like the picture on the bottom row). 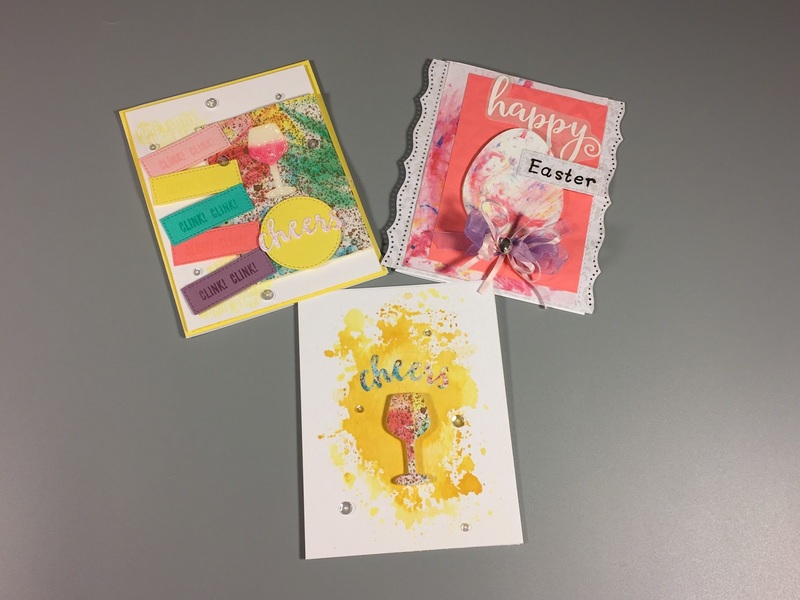 One is an Easter themed card (not part of my card swap). The egg was die cut using a Cricut explore machine. I uploaded a scan of my background to Design Space and then used it as a pattern fill for my egg. If you don’t own the machine, it doesn’t mean you cannot use the background, but you would need a die to cut the egg shape or manually cut from a template with scissors or a craft knife. The card in the top left is one I created for the Reverse Confetti sketch challenge. If you would like to see more details on this card as well as the one on the bottom row, the post is here. 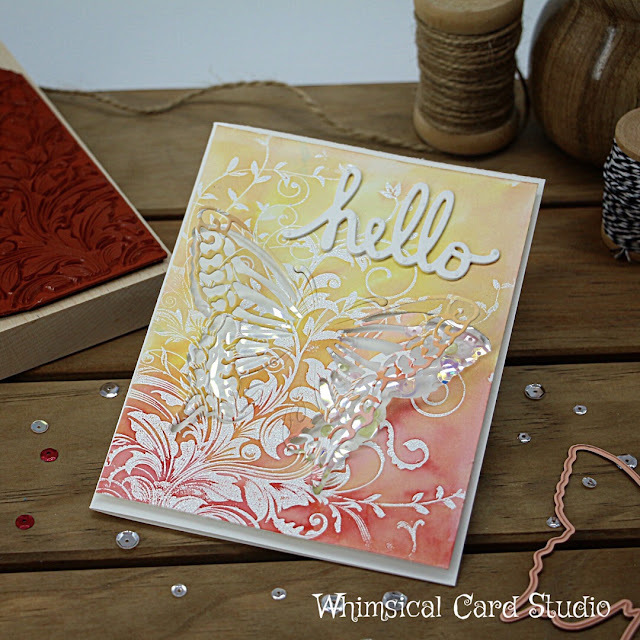 One is a stamped background using 3 different leaf stamps from So Suzy Stamps. I added a panel of vellum and then a copper heat foiled sentiment (using the Minc machine) to top it off. It looks black in this photo, but in real life it is a very shimmery coppery color. The card on the right is a bit “out there” so it may not be everyone’s thing but I like it. This is not one of my usual color combos, but somehow it seemed to all work together. The last group is the stenciled backgrounds in two patterns. On two of the cards I added a critter from the Crazy Birds and Crazy Dogs Tim Holtz set. I made the card with the dog interactive by adding an action wobble to it so the dog “wags”. I thought it was just downright adorable. The lavender card is one I kept pretty simple with a band of dry embossed colored paper, framed with silver washi tape and the hello die cut in white cardstock to finish it. That’s it for this rather large collection of cards. Please do check out the video as well or instead if you prefer to watch rather than read..haha. Don’t forget….come back to the blog on Saturday to get the scoop on how these backgrounds were created, in particular the marbling techniques. 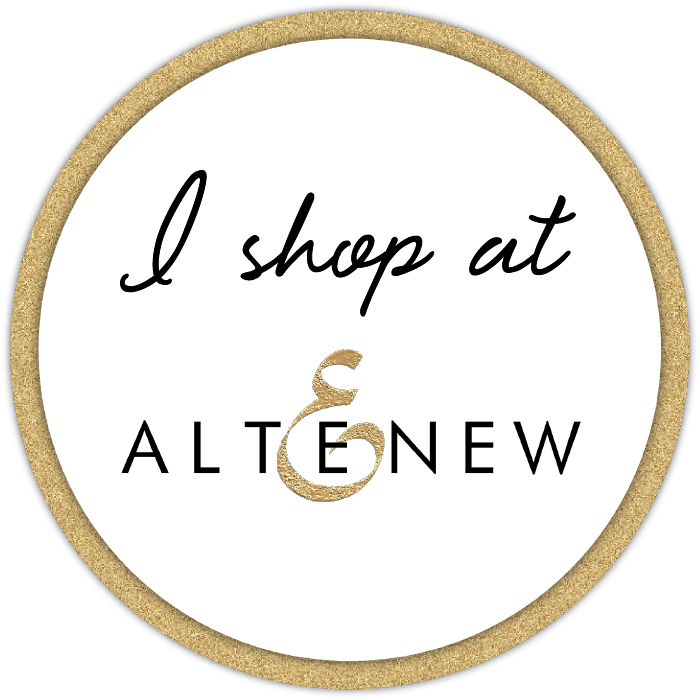 There’s a freebie involved if you decide to subscribe to my blog – worth the visit! Next week I will endeavor to share some of the coolness from my weekend at the Expo.